NEW YORK - Jan. 16, 2018 - PRLog -- Jacqueline Dupree will be a featured guest on the Jimmy Star Show with Ron Russell live radio/tv show hosted by king of cool Jimmy Star along with cool man about town Ron Russell to discuss her new single "I Don't Want You No More", her career and the entertainment industries at large. The Jimmy Star Show with Ron Russell is tv/radio's coolest hit show, featuring the coolest in music, entertainment, fashion and pop culture, all from a fun industry insider perspective in a completely live, unedited fast-paced two-hour conversational format. Diva Jackie Dupree is an international recording artist and drag entertainer born and raised in Detroit, Michigan. She moved to the East Coast to pursue a singing and acting career. She has been a member of and played for the New York Gay Football League for over a decade. Jackie has shared the stage with many notable entertainers, including Grace Jones, Regina Bell, and RuPaul, to name a few. She has appeared at venues as diverse as The Russian Tea Room, Copacabana, and XL Nightclub. Additionally, she has performed in venues around the world, such as in Iceland, Turkey, and Bermuda. Diva Jackie Dupree is a regular staple at the legendary national landmark, The STONEWALL Inn. 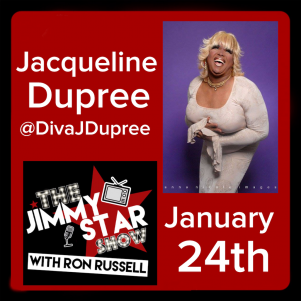 The Jimmy Star Show is pleased to showcase the expertise and talent of Jacqueline Dupree and all anticipate a fun and informative time talking with her about her career and the entertainment industries at large. Join King of Cool Jimmy Star, and Cool Man about town Ron Russell as they have a playful and sometimes wild time with the talented featured guest! To hear/see Diva Jackie Dupree live on the Jimmy Star Show with Ron Russell tune in to w4cy radio on Wednesday January 24th, 2018 from 3-5 pm ET and 12-2 pm PT online at www.w4cy.com from anywhere in the world!